...there is a successful background". I believe this was one on Bob Schwalberg's* basic axioms behind the success of any given photograph. He reminded us that the background is important because it helps to establish a context for the photograph, and in this case prevents the subjects from disappearing into inky blackness. I am a huge fan of Nikon's iTTL (Intelligent Through The Lens) flash metering, part of what they call the Creative Lighting System. The simplicity of operation has saved my skin many times, and once you get the hang of it, it's pretty simple. 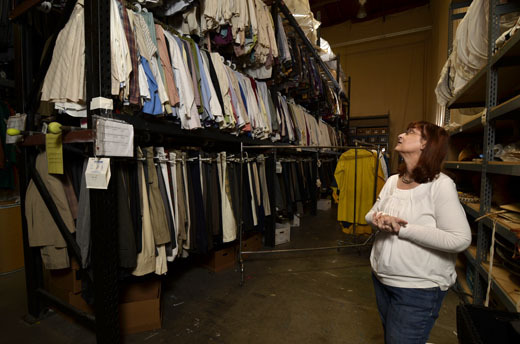 The photo was made at the TheatreWorks costume warehouse. 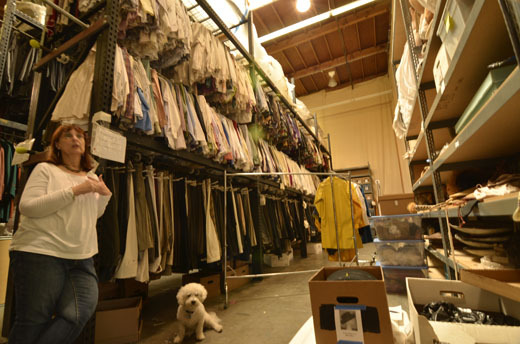 I wanted to make a photograph that gave the viewer a sense of how large the collection of costumes was. My three subjects were co-chairs for an upcoming fundraising event, and I wanted a spontaneous, fun photo of them "trying on" outfits. I chose this particular isle because the far wall wasn't cluttered, and there was enough detail to make the photo visually interesting. I promised to start shooting at 1:45 so that everybody could leave by 2:00, so I did as much as I could before my subjects arrived. Step 1: Evaluate Ambient Light. I set the camera for Aperture Priority, F 5.6, and ISO 200. I decided to leave the ISO at 200 as a starting point. The camera chose 1/4 second for my chosen ISO and aperture, too slow to handhold. The light, coming from directly overhead, was a mixture of skylight, fluorescent, and hot incandescents, making for an odd match of color. Step 2: Foreground Light. For my next shot, I added a light stand mounted, shoot-through Zumbrella with a Nikon speed light. The light stand was put the Zumbrella about eight feet off the ground so it would resemble the top lighting in the warehouse. I also set the shutter speed to 1/60, just fast enough to hand hold. With my speed light set for a +2/3 exposure boost, I got this shot. Because the Zumbrella was used in the shoot-through mode, the speed light couldn't actually see the Commander speed light mounted in the camera's hot shoe. But the sensor eye did face the wall, and my commander was pointed backwards so light could bounce off the wall where the sensor could see it. Step 3: Background Lighting. The background was now much too dark, so I added three speed lights to brighten things up. The first was perpendicular to the row of clothing in the background, the second pointed toward the back wall, and the third was a edge light aimed at the clothing. There was also enough light from the camera-mounted commander to reach back and trigger the these speed lihgts, but just barely. Here's a quick test, with a helpful dog in the foreground. If you look into the background, you can see a hot-spot near the back of the photo. The three speed lights were clustered on a desk in the back of the warehouse, all with their sensor eyes pointing toward me. After some quick re-arrangement of the set, I started shooting. There wasn't much direction here, just putting the tallest person in the center, and pretty much let them enjoy themselves. I had planned for a more "posed look", but they seemed to be having more fun just joking about their choices. Here again is the final shot. First a warning, and then some advice. I was lucky that the interior, however dark, had enough reflective surfaces for the commander to "communicate" with all of the remote speed lights. To prevent lens flare, it is better if the background lights do not shine directly into the lens. But having them behind the subjects makes it harder for the Commander to communicate with them. I once mounted a commander on its own 9-foot light stand and connected it the camera via a daisy chain of iTTL cables. The elevated position insured that all the remotes could "see" the commander's pre-flash signals. In a pinch, the speed lights could have been re-configured to SU-4 mode, a photo-sensative alterntative to iTTL. SU-4 sensor sensativity is much better than that of the iTTL mode, but speed lights so configured must be manually "calibrated" to adjust the light output. For more information, check David Hobby's blog on the subject. *Bob Schwalberg was a writer for Popular Photography. I could not find any biographical references.